Natural England is the body responsible for enhancing and managing the natural environment. 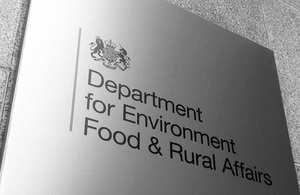 Professor David Hill’s appointment as Deputy Chair of Natural England has been extended, and Dr Joe Horwood has been reappointed to the Board of Natural England by Environment Secretary, Caroline Spelman. Professor Hill’s appointment will run until to 30 June 2013 and he will receive a remuneration of £17,056 a year for 52 days work. Dr Horwood’s appointment will run until 30 September 2015 and he will receive a remuneration of £12,136 a year for 37 days work. The appointments have been made in accordance with the Code issued by the Commissioner for Public Appointments. All appointments are made on merit and political activity plays no part in the selection process. Professor David Hill has been a member of Natural England since October 2006, and was appointed Deputy Chair in February 2011. He has significant experience in consultancy, nature conservation and company business strategy. He runs an ecological consultancy company, is Chairman of the Environment Bank Ltd and was previously Chief Scientific Adviser to RPS Group plc. Over the past three years he has been actively involved in promoting environmental markets to provide new and innovative ways of mitigating for impacts on ecosystem services arising from development, industry and corporate businesses. He is a Fellow and past President of the Institute of Ecology and Environmental Management and has published extensively on ecological issues. Dr Joe Horwood has been a member of Natural England since October 2009 and is a member of the JNCC Marine Protected Areas sub-group. He has a background in mathematics and zoology applied in marine ecology and resource management. He has been a member of the Board of the International Council for Exploration of the Sea (ICES) since 1998, was Chief Science Advisor at the Centre for Environment, Fisheries and Aquaculture Science (CEFAS) from 1995 to 2010 and was President of ICES from 2006 to 2009. He was also on the Board of the Marine Biological Association from 1998 to 2001. He has served on the science advisory committees of the International Whaling Commission, ICES and the European Commission, and on the UK’s Marine Science Co-ordination Committee. He is a Fellow of the Royal Statistical Society, and of the Institute of Mathematics and its Applications, and is a member of the British Ecological Society, the Challenger Society and the Suffolk Wildlife Trust. He has published on a variety of marine issues including whales, fisheries and marine protected areas.